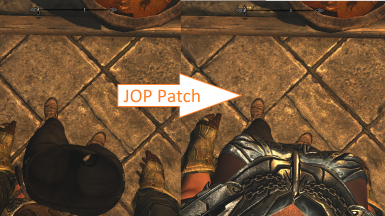 I patched Imperious - Races of Skyrim but for whatever reason I'm still getting the invisible feet issue. I do have Joy of Perspective.esp disabled. Edit: Found the issue, reporting it as a bug. Hey mate, that's some great and useful content your sharing. Thank you very much. +Where do you put the patch esp in your load order ? Can I trust LOOT ? I'm utterly confused. I just want to fix the invisible legs issue with Joy Of Perspective, but I can't figure out how o actually use this. Do I install it with NMM? Do I need to run it through a different program? I have zero experience with this kind of thing, and help would be appreciated. 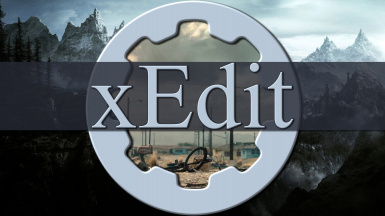 This script requires SSEEdit/xEdit (https://www.nexusmods.com/skyrimspecialedition/mods/164/?). After downloading this file ("Valdacil Patcher xEdit-10959-2017-08-08.zip"), unzip the file and put "xPatch-autoComplete.pas" into the "Edit Scripts" directory of xEdit. If you're using NMM or Mod Organizer 2, run xEdit as an executable from within NMM or MO2. Run xEdit, and your active plugins should all have a checkmark next to it. Click "Okay" and xEdit will start loading. After you see the "Background Loader: finished" line in the message box, select the plugin appearing below the last official DLC you own, Shift+End to select all the mods you have activated, then right-click on any of the highlighted plugins. Select "Apply Script." Navigate through the dropdown menu and select "_xPatch-autoComplete" (which will be near the top entry). If you only want the JOP Patch, check only that and deselect everything else. Name your patch anything you want, then click "OK" and wait. It can take anywhere between 1-7 minutes depending on how many ESPs it needs to process. After waiting, you'll see a new plugin at the bottom of your xEdit load order with your patch name. Exit xEdit and you'll see a "Save changed files" window. Make sure your patch is checked and select to backup your plugin, then click "OK". 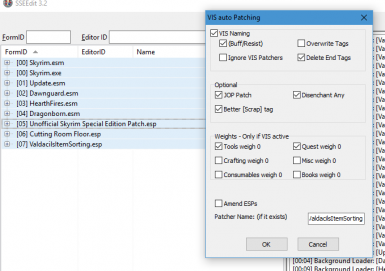 Activate your patch in your mod manager, and you're all set to play. in the options should we have "amend ESPs" checked? (I'm guessing not as it might edit the original ESPs.) I see it both way in the different screenshots. Even after seeming to build a patch successfully the body armor didn't show up on my character from what I could see. Still just the boots. Any ideas? ntblood, i had the same issue as you, after selecting all your mods and pressing 'apply scripts' and selecting '_xPatch-autocomplete' tick the 'include sudirectories' and carry on with the process, i kept trying to get it working and found that that had to be ticked and when i did, it worked, hope it works for you too. My legs were also invisible from Joy of Perspective so I followed your tutorial here but it didn't do anything. I think JoP just hates me. 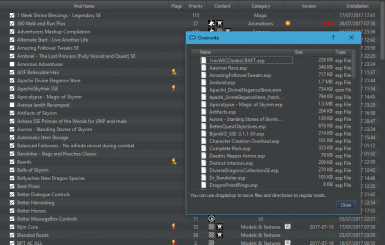 This script has been made to enhance mod-added content's support for specific mods, such as VIS or JOP. About your invisible legs, to me it has nothing to do with the script itself. It might be anything from your mod order, to corrupted textures or missing meshes. I think (but can't be sure) that it has something to do with a mod you installed which changes body textures. The script just ensure custom armory is handeled by JOP and doesnt actually deal with body textures. 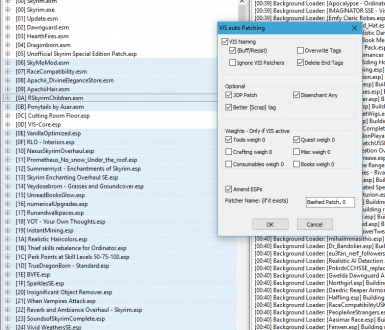 ** if it doesn't work, try tweaking your mod order as some textures would be overwritten in the virtual machine by a mod whose provided meshes doesnt match. ** if it doesn't work, try installing another body texture mod over your installation. One mod which is known to be compatible with JOP. Hello, i downloaded the file yesterday, then after reading the description some times i decided to apply the script. 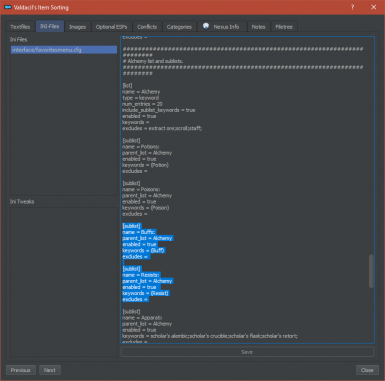 Loading XEdit from Mo2 i first selected files like the user Remotely explained in the post below. 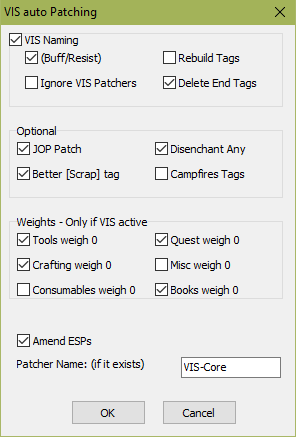 first try: I kind of blindly selected all files below the USSEP, including some ESM's and my bashed patch. This resulted in a long wait with lots of errors regarding Bruma and it's patches. ESP was created. Second Try: Took much less time to apply since this time i did not select any ESM's, still got some errors in the process with bruma and bash patches, ESP created at the end. Since i still can't figure out what esp's i should select in XEdit, i did not check the results. I'd like to ask first if any of the other users applyed this scipt to their load order having already introduced a Bashed patch. Can someone point out what should be selected, do i leave my bashed esps disabled before running the script or do i enable all in MO2? should i select the bashed patch too or, as i suppose will this later be integrated in it? Is it safe to directly create a weightless+ jop patch or should i do things individually since i'm patching it all anyway? I did not find much info on this, my goal was to visify immersive weapons to tag all that good stuff. With SSEEdit V4.0, this script was still running after an hour. Is there a problem between this script and the new SSEEdit? Edit: I decided to start from scratch and deleted the VIS-Core.esp. When I ran the script to create the VIS-Core, I got an error: "Error in unit '_AutoPatcher on line 118: Type of expression must be integer." got the same error...did you solve it? OK, according to ElminsterAU, the author of SSEedit, the error only happens in the 64-bit version. (Which people shouldn't be using anyway according to him, as it's slower, and should only be used if you're getting "Out of memory" errors with the 32-bit version), So Use the 32-bit version of SSEedit and the problem should go away. The latest version of SSEedit fixed the problem! [Solved] How do I revert the buff/resist patch? I tried reinstalling VIS and patching with the rebuild patch option to revert it but doesn't work. I want to revert it cuz keeping raw foods as a raw food seems tidy to me. I didn't realize this buff/resist option also applies to all raw foods that give you buff. Can anyone know how to do it? Edit: Does this patch changes all the buffs from foods? All the buffs and effects are changed to something else like for Goat cheese sliced: Restore 10 HP ->Partial wheel (8 servings) Stamina regenerates 4% faster for 2 hrs. I uninstalled CACO(Complete Alchemy and Cooking Overhaul) and all the problems I had were gone charmingly. Interesting thing happened tonight. A few days after building my patch, I started crashing every time I tried to open the magic menu. I had installed a couple new mods, so I rebuilt my patch to see if it would fix my problem. In a way, it did. While rebuilding, I just happened to look at the output in xEdit and saw an entry about being unable to copy an element in Magelight - a spell I had learned tonight! I used the console to remove Magelight from my known spells, and viola! I can reopen my magic menu! tl;dr: Watch the script run, you may find a CTD's source. Thanks for this brilliant script!